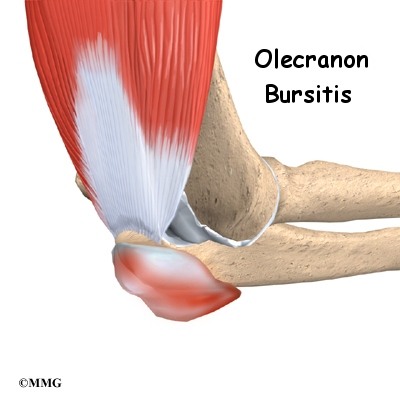 Olecranon bursitis is inflammation of a small sac of fluid located on the tip of the elbow. This inflammation can cause many problems in the elbow. Where is the olecranon bursa, and what does it do? The olecranon bursa is located between the tip, or point, of the elbow (called the olecranon) and the overlying skin. This bursa allows the elbow to bend and straighten freely underneath the skin. How does olecranon bursitis develop? Bursitis is the inflammation of a bursa. The olecranon bursa can become irritated and inflamed in a number of ways. In some cases, a direct blow or a fall onto the elbow can damage the bursa. This usually causes bleeding into the bursa sac, because the blood vessels in the tissues that make up the bursa are damaged and torn. In the skin this would simply form a bruise, but in a bursa blood may actually fill the bursa sac. This causes the bursa to swell up like a rubber balloon filled with water. The blood in the bursa is thought to cause an inflammatory reaction. The walls of the bursa may thicken and remain thickened and tender even after the blood has been absorbed by the body. This thickening and swelling of the bursa is referred to as olecranon bursitis. Olecranon bursitis can also occur over a longer period of time. People who constantly put their elbows on a hard surface as part of their activities or job can repeatedly injure the bursa. This repeated injury can lead to irritation and thickening of the bursa over time. The chronic irritation leads to the same condition in the end: olecranon bursitis. The olecranon bursa can also become infected. This may occur without any warning, or it may be caused by a small injury and infection of the skin over the bursa that spreads down into the bursa. In this case, instead of blood or inflammatory fluid in the bursa, it becomes filled with pus. The area around the bursa becomes hot, red, and very tender. What does olecranon bursitis feel like? Olecranon bursitis causes pain and swelling in the area at the tip of the elbow. It may be very difficult to put the elbow down on a surface due to the tenderness. If the condition has been present for some time, small lumps may be felt underneath the skin over the olecranon. Sometimes these lumps feel as though something is floating around in the olecranon bursa, and they can be very tender. These lumps are usually the thickened folds of bursa tissue that have formed in response to chronic inflammation. 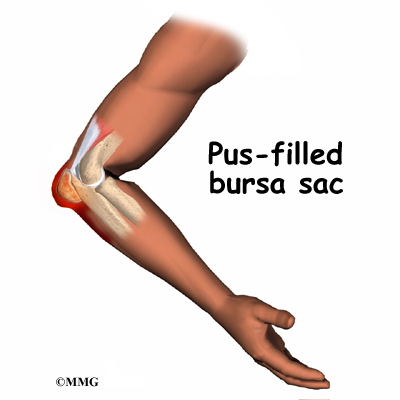 The bursa sac may swell and fill with fluid at times. This is usually related to your activity level, and more activity usually causes more swelling. Over time the bursa can grow very thick, almost like an elbow pad on the olecranon. Finally, if the bursa becomes infected, the elbow becomes swollen and very tender and warm to the touch around the bursa. You may run a fever and feel chills. An abscess, or area of pus, may form on the elbow. If the infection is not treated quickly, the abscess may even begin to drain, meaning the pus begins to seep out. The diagnosis of olecranon bursitis is usually obvious from the physical examination. In cases where the elbow swells immediately after a fall or other injury to the elbow, X-rays may be necessary to make sure that the elbow isn't fractured. Usually chronic olecranon bursitis is also easy to diagnose without any special tests. If your doctor is uncertain whether or not the bursa is infected, a needle may be inserted into the bursa and the fluid removed. This fluid will be sent to a lab for tests. The results are used to determine whether infection is present. If so, the type of bacteria that is causing the infection is identified. Your doctor will use this information to know what antibiotic will work best to cure the infection. What can be done for olecranon bursitis? Olecranon bursitis that is caused by an injury will usually go away on its own. The body will absorb the blood in the bursa over several weeks, and the bursa should return to normal. If swelling in the bursa is causing a slow recovery, a needle may be inserted to drain the blood and speed up the process. There is a slight risk of infection in putting a needle into the bursa. Chronic olecranon bursitis is sometimes a real nuisance. The swelling and tenderness get in the way and causes pain. This can create a hardship both at work and during recreational activities. Treatment usually starts by trying to control the inflammation. This may include a short period of rest. Medications such as ibuprofen and aspirin may be suggested by your doctor to control the inflammation and swelling. An elbow pad might be useful in making it easier to put the elbow on hard surfaces. If the bursa remains filled with fluid, a needle can be inserted and the fluid drained. During the drainage procedure, if there is no evidence of infection, a small amount of cortisone can be injected into the bursa to control the inflammation. Again, there is a small risk of infection if the bursa is drained with a needle. Your doctor may also prescribe professional rehabilitation to evaluate and treat the problems that are causing your symptoms. Your physical or occupational therapist may suggest the use of heat, ice, and ultrasound to help calm pain and swelling. You may be given tips and strategies to avoid repetitive elbow motion and to do your activities without putting extra pressure on your elbows. If an infection is found to be causing the olecranon bursitis, the bursa will need to be drained with a needle, perhaps several times over the first few days. You will be placed on antibiotics for several days. If the infection is slow to heal, the bursa may have to be drained surgically. This method is different than the nonsurgical drainage mentioned earlier. Surgery to drain the bursa begins with an incision to open the bursa. The skin and bursa are kept open by inserting a drain tube into the bursa for several days. This allows the pus to drain and helps the antibiotics clear up the infection. To remove the olecranon bursa, an incision is made over the tip of the elbow. 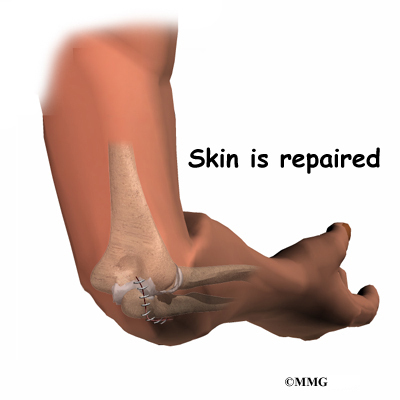 Since the bursa is outside of the elbow joint, the joint is never entered. The thickened bursa sac is removed, and the skin is repaired with stitches. Your elbow may be placed in a splint to rest the elbow and prevent it from moving for a few days. This allows the wound to begin to heal and prevents bleeding into the area where the bursa was removed. Some types of bursae will grow back after surgery, because the skin needs to slide over the olecranon smoothly. The body forms another bursa as a response to the movement of the olecranon against the skin during the healing phase. If all goes well, the bursa that returns after surgery will not be thick and painful, but more like a normal bursa. Chronic olecranon bursitis will usually improve over a period of time from weeks to months. The fluid-filled sac is not necessarily a problem. If it does not cause pain, it is not always a cause for alarm or treatment. The sac of fluid may come and go with variation in activity. This is normal. If surgery is required, you and your surgeon will come up with a plan for your rehabilitation. You will have a period of rest. You will also need to start a careful and gradual exercise program. Patients often work with a physical or occupational therapist to direct the exercises for their rehabilitation program after surgery.